Third and final week of the fake meat chicken wing extravaganza! To finish us up, we've got Gardein Classic Style Buffalo Wings. These were the most wing-like of all the items we tested out. I was warned in a couple places on the bag that the sauce is very spicy, so instead of following the directions that said to cover the wings with the sauce before baking, I baked them plain. This was a very good idea. The sauce was VERY spicy! And, I'm told, not very tasty. It was compared to straight Tabasco sauce. The directions said to bake these (with the sauce) until crisp, but I'm not sure that was going to happen. Perhaps the sauce makes them crisp up, which would be the only sauce in the entire world that would do that, but alone in the oven, these were not going to get crispy. They were too moist to get crispy. In fact, they exuded a pretty fair amount of liquid onto the tray while they were baking. Maybe if I'd let this continue, there would be some crisping, but then the rest of the wing would be terribly dry, so I made a judgement call and pulled them out. I did not try them with the sauce, since I'd already tasted the sauce and found it to be too hot for me. I tried one on its own and it was actually pretty okay. The texture was pretty similar to chicken, and there weren't any weird flavors or anything. It was pretty bland alone, as you might expect, so I played around with some seasonings. I had a little jar of Turkish seasoning, which turned out to be very tasty on these wings. Garam masala was also a nice accompaniment. I would have eaten a few more of these, but I had some real-meat wings in the oven, and I wanted to save room for them. Flavor - not much going on alone, which makes it pretty amenable to whatever you'd like to season it with. You should taste the sauce before adding it, though. First off, I'd like to comment on the copy on the box. I love to check out the promises companies make before I eat their products, and this one made some very big promises. "Vegetarian Chicken Drumsticks are completely meatless, yet have the same flavor, moistness and tenderness of your mother's homemade recipe." That's a tall order, even though I don't remember my mom ever making us chicken drumsticks with curry sauce. But okay, I'll give these a shot. When deciding on a cooking method (the box lists 4 options: stovetop, oven, deep fry, and microwave) I went with the microwave option because it was the only one listed that didn't include defrosting them first. On the website, the oven directions don't say to defrost them, but I only had the box to work with at the time, and it says to defrost. I also pondered the irony of buying this vegetarian item that talks all kinds of talk about choosing to be healthy and then deep-frying it. But into the microwave they went. Within a very short two minutes, I had piping hot vegetarian chicken drumsticks and some pretty sweet curry sauce to go with them. Before I get to the tasting, I need to comment on one thing. In the ingredients list, the final ingredient listed is "tofu skin". We discussed what that might mean, since, to my knowledge, tofu does not have skin. I suggested that, perhaps, they used tofu to create a fake chicken skin for the drumsticks, and it appears that I was correct. The website mentions that their drumsticks are "moist, tender and even replicate the skin of real chicken". The result of this replication, however, was that they came out of the microwave looking wrinkly. Not terribly appetizing, but I kept going anyway. 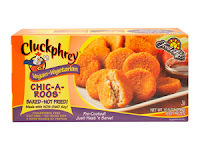 The picture on the box, by the way, I suspect was what these would look like if you deep-fried them. I wasn't expecting golden-brown drumsticks out of the microwave, but they were grayish and wrinkly. And the container of sauce in the picture is not the sauce that comes with the drumsticks. That is not the curry sauce. I think it is perhaps a sweet and sour sauce, like the serving suggestion information on the box. Apparently these are "great with BBQ sauce, sweet & sour or honey mustard sauce" but for some reason they sent them to me with a curry sauce. Oh well. When it came time to actually eat these, I was not really that excited about it, but I did it anyway. I put the drumstick in my mouth, bit down, and then experienced the extremely unpleasant sensation of my teeth bouncing back, not having actually removed any of the drumstick. It was like trying to take a bite of a dog's chew-toy. Except more juicy and less squeaky. I cut off a piece with a fork and popped it into my mouth. Once it was in there, the texture wasn't too bad, but that first impression was pretty awful. I don't know how much of the texture was due to the microwave and how much was just the actual texture of the product. I think I would be willing to try these again and use a different cooking method, just to test that out, but it might be a little while. I need to let the memory of the rubbery texture fade a little. Once I got past the texture, the flavor was… okay. Nothing special. 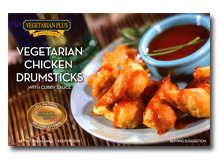 The curry sauce that came with these was fine, but for some reason, it just didn't match well with the drumsticks. I think a sweet and sour sauce would be pretty good, and next time I'll probably try it that way. Texture - moist, yes; tender, no; rubbery - that's more like it! As I'm sure many of you know, the Super Bowl happened recently. 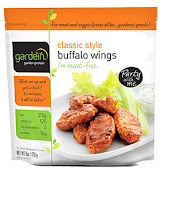 I used this opportunity to bust out all the fake meat chicken wings (or wing-like items) that were in my freezer. So get ready for the three-part wing-like series! 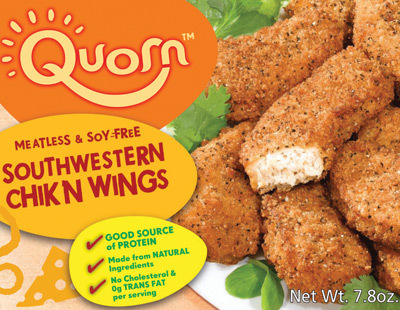 First up, Quorn's Southwestern Chik'n Wing. These looked like your basic chicken nugget, but with more spice. I baked them in the oven for about 12 minutes, as directed, then noticed the direction to flip them over half way. So I flipped them over and baked them a couple extra minutes. This was a good idea. As the package warned, these were very hot when they came out of the oven, obviously. After letting them cool a few minutes, we dug in. Just as I expected from their appearance, they were pretty much just spicy chicken nuggets. And the more of them I ate, the spicier they got. Not above my tolerance level, but pretty close. So if you're a big spice baby like me, keep a glass of milk around or whatever else you use to dull the heat. But they did taste pretty good, so the pain was worth it. I don't really know what else to say about these other than the fact that they're not very wing-y. I'm not expecting bones, of course, but perhaps fake meat companies shouldn't attempt to imitate something that is going to be impossible. Just call them spicy southwestern chik'n nuggets and call it a day. 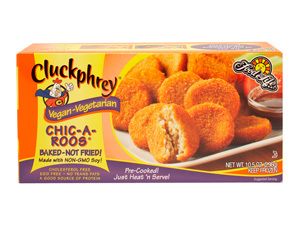 This week, I'm testing out the product with the best name that I've found so far: Cluckphrey Chic-A-Roos. The company that makes these, Food For Life, also makes a fake beef burger called Moophrey burgers. Cluckphrey and Moophrey. Those names just kill me. The website is a little goofy - in the Cluckphrey section, if you click on the patties, you get to the Chick-A Roos, and if you click on the Chic-A-Roos, you get to the patties. But whatever. So let's get right to it. These are chicken nuggets. I decided to take a small risk and cook them in my toaster oven rather than my conventional oven, since I was only going to cook up a few and didn't want to spend a ton of time preheating my oven. I was also fully prepared to do a second test if that didn't work out, since I was totally flouting the printed directions. I gave them about 9 or 10 minutes in the toaster oven, until they were starting to just brown on the edges. I pulled them out, let them cool a minute or so, and gave them a taste. First impression was the crispy texture. The toaster oven did just what a real oven would do, as far as the crispy exterior. I was very pleased with this result. Once I got through the crunchy bit, though, things started to go downhill. The inside was VERY mushy. Like, pre-chewed mushy. Not a great sensation. However, the flavor of the nugget was surprisingly similar to chicken. Well, frozen chicken nuggets, anyway. It took well to a variety of dipping sauces. After a few nuggets, the texture wasn't so weird. Just took some getting used to. All in all, these are not too bad, although they're not at the top of my list for chicken-free chicken nuggets. The awesome name isn't quite enough to get past the weird mushiness. Texture - crispy on the outside, really mushy on the inside.